A set of limited edition fragrances released in 2012, I spent some time tracking down these fragrances via eBay as they've become fairly difficult to find as they were released a few years ago now. I'm a huge fan of Marc Jacobs scents, this collection was no exception to that rule; I really liked how they're very different to the original versions of these scents but kept the same bottle shapes so they're still recongiseable as a part of the set. The limited edition collections are always interesting as they usually have a theme through the scent, colour or idea. In this case, the collection was definitely made with summer in mind as its full of bright colours, florals and fruity undertones. The main issue with any Marc Jacobs scent is that they're fairly high end price wise; you need to be prepared to spend quite a bit of your money to own a full set, but they are worth the money as they look and smell amazing. An alternative scent to the original Daisy, visually the bottle is very similar but with a colourful twist; filled with a bright orange fragrance and topped with three daisies in different sizes in green, orange and hot pink. I quite like how the bottle looks, as its like a brighter version of the original which is nice. I'm not usually a fan of bright colours, but this bottle makes me feel fairly optimistic when I look at it. The smell is lovely, with notes of spring blossoms, lychee, mandarin, red currant, guava, violet and lily of the valley. The Sunshine theme is definitely apparent with the burst of bright colours and the sunny flavours of fresh fruits alongside some florals. The RRP of this scent was £49, which is fairly expensive but the smell does last for a few hours and feels lovely against the skin which is a bonus. Possibly my favourite scent not only of this collection, but out of all of the Marc Jacobs fragrances that I own. Visually, it's a nice bottle with a pink fragrance inside topped off with a Daisy bouquet in varying sizes in shades of purple, hot pink, lime green and bright orange all centered with gold and used to hide a gold spritzer. It's not my favourite selection of colours, but it fits well with the theme of Sunshine and therefore is a good reminder of long summer days. The scent is beautiful, smelling of fruit blossom, strawberry, pink grapefruit, jasmine, rose, violet leaves, amber and oak moss. I can't even describe how much I love it, I feel really confident when I wear it. I've found that it lasts (like many other Marc Jacobs fragrances) for a few hours, and I genuinely do like the feel of it against my skin. The original price was around £54, which is fairly expensive but considering how much I adore this scent, I would be more than willing to pay that price over and over again. I absolutely love the look of this bottle, with its lime green base topped off with a large pink rose and matching green leaf attached to the neck of the bottle with a silver wire shape. 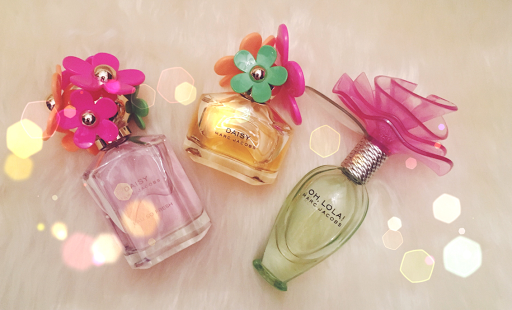 I think it looks really lovely and is a great visual alternative to the other Lola fragrances. The scent itself smells of raspberry, strawberry, pear, peony, magnolia, cyclamen, vanilla and sandalwood. In all honesty, I'm not a massive fan of this scent, it lasts very well but the smell itself isn't one that I'm crazy for; I can't explain why. I think it smells a little lacklustre, all I can smell is bland pear which is a massive shame as I really wanted to love it. The original price for this perfume was £45 which does seem really excessive to me as I'm not a fan of the scent. That said, I really love the design of the bottle so it was a genuine disappointment to not love the scent.